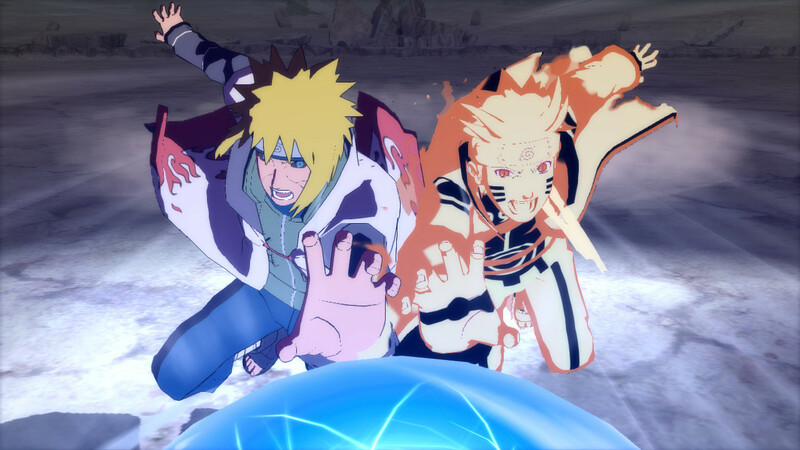 Could CyberConnect2 Be Hinting Towards Ten Tails Obito’s Inclusion In Naruto Storm Revolution? Cyberconnect 2 are known for going into the manga and pulling out certain scenes to use in-game. They did it very well with JoJo’s Bizarre Adventure: All Star Battle, and they did a good job once again with Naruto Storm 3. While its fun to find where a specific attack comes from in the manga, it can also lead to shocking surprises… potentially. The screenshots below lead us to believe that CC2 is covering the manga up until the point that Obito becomes the Ten Tails Jinchuuriki. Most fans have already guessed that, but we’ve seen no proof, until now. 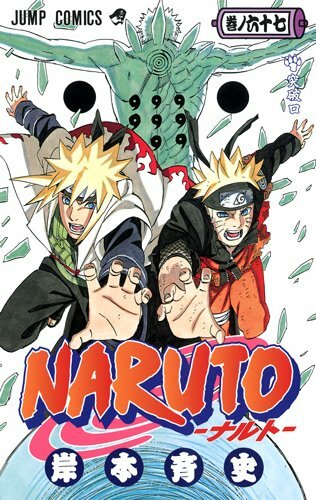 As you can see, the scene for Minato and Naruto’s Combination Ougi is taken from Manga Volume 67: Breakthrough (Officially translated as “An Opening”), which also features Juubito on the cover. Juubito wasn’t found in the games code, but could he be included in a future update (a la Full Burst)? Madara wasn’t found in the demo code for Storm 3 in addition to Matsuyama revealing not all characters have been shown, not to mention stages shown in the trailer also weren’t found in Revolution’s code. It is still very possible Juubito will be in the final version of the game, or some other yet-to-be-revealed character.. Even if that were the case (which by all accounts it isn’t, and I myself remember it not being revealed beforehand) the circumstances are very different. For 1, CC2 now knows about datamining and can prepare ahead of time for it. Second, Matsuyama stated there is at least 1 character left to be revealed. 3rd I don’t see any reason to implement a stage then remove it. And last but not least, the demo was released a month earlier then any previous one. CC2 never goes on 2 month droughts when it comes to info. They always have reveals up until the last few weeks before release. Umm.. if CC2 knew about datamining and were prepared to fight against it, then WHY would they add EVERY SINGLE DETAIL purposely in the demo? Madara was actually found the demo code according to Dei. Kurumi waz here. Cc2 be hidding. They fixed every other kages moveset so far and have been releasing scans of each of them weekly so hopefully well see him and hiruzen Wednesday. Come to think of it, didn’t Storm 3 (the original, not Full Burst) have a Day One update? Madara wasn’t found in the files from the Storm 3 demo, but made it on disc. Perhaps Juubito is the same. His files are on disc, but not in the demo, which would need updated? I’m probably just talking nonsense at this point. I don’t know, i’m pretty sure it’s harder then you think for CC2 to create new characters. Didn’t Kabuto in Sage mode take like 4 months to create? I think if they only worked on the character it could take 2 months (with multiple people helping) some of the developement time is tweaking and expanding the moveset, I think sage kabuto was a special case because he also had a boss battle and a very well developed moveset. They probobly have been working on him for a while so hopefully he’ll play good. Wow you’ve made a game before? Considering your response, I’m going with no. Not only is it hard bu it is CRAZY expensive even for just 1. If they aren’t allocated the funds, they can’t make characters. Why is Minato not in Edo Tensei mode on the Manga Cover Art? Why was Naruto carrying an ax in one of the covers? Because it is JUST a cover that has no significance to the content. They don’t wanna spoil more than necessary, I suppose. And they’d all be different, just like the Naruto and Sasukes. Look at Dragon Ball Z: Budokai Tenkaichi 3 with its 5 Gokus, 5 Gohans, and 6 Vegetas. The Naruto series is no different, some characters can justify taking up multiple slots. Honestly, I actually see him being in a Full Burst-like update. But then again ya never know, he could be in the fullgame too, but wasn’t implemented in the Demo’s code. Well with JoJo ASB, they NEEDED to copy the scenes over to the game as that`s the point. When a manga/anime becomes a game it has to have the main point of the game, but if ASB never had the JoJo-tachi or the majority of scenes found in the manga, then the game would`ve been a failure. Gonna be eating those Salty Kushina tears when Rev drops. Madara: it be pretty cool yet like gon would say…. I don’t care. heh. I hope they give Obito his Konoha costume from when he fantasized about being Hokage in the manga. Then again, that could be a long shot since that dream didn’t appear until a little while before Naruto extracted the Ten-Tails from him, and if they add Ten-Tails Jinchuriki Obito, he might be a special character like Taka Sasuke and Lars Alexandersson in Storm 2, Snake Cloak Kabuto and Nine-Tails Chakra Cloak Naruto in Generations, EMS Sasuke in Storm 3 (prior to Full Burst), and Sage Kabuto in Full Burst. Maybe, but same time it could just be the long begged for father son Rasengan. Not saying that I doubt it’s a hint, but for me I need a more solid hint, of course there’s always the final reveal and dlc. Actually that demo had a lot of things that we can’t tell you guys because it would spoil the whole game and probably get us into legal trouble at that point. But yes, Juubito wasn’t there but literally everything else was (literally everything you can think of). No need for the insults though. So this unrevealed character was in the code as well (as Matsuyama said not every character has been revealed)? What about the stages that don’t appear in the code but are in the latest trailer (why remove them after inserting them, that’s more work)? I don’t see CC2 allowing info to leak that a second time, and by most accounts, Madara wasn’t found in storm 3’s demo code. I really wish I could tell you what else I found in the demo but its an area that really will spoil the game. But as for more characters MAYBE we’ll have one more in the final release which anyone can always dig into and find out if he’s in or DLC. Just to clear some things up, yes I did find Madara in the Storm 3 demo. So Juubito is likely to be a DLC only character, but at the same time that’s not really possible. Him being in the game would be a bad move for CC2. To the FU CC2 guy none of your posts will be visible becuase your name will never get past the filter. Use a more appropriate name please.